African breadfruit is in a food class of its own. I was not sure where to put it but finally settled for beans section because breadfruit seeds are most similar to beans. It is known as Ukwa in Igbo and the scientific name is Treculia africana. 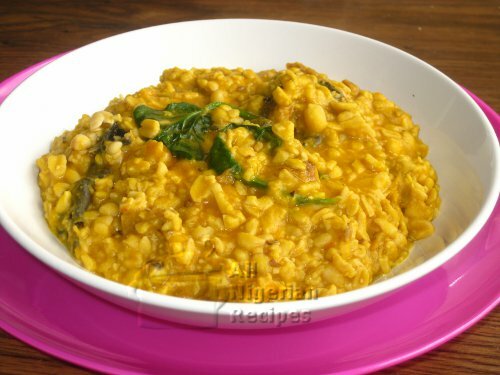 Ukwa is such a versatile food with a natural delicious flavour. It can be cooked plain without any ingredient, not even salt and it will taste great especially when prepared with fresh Ukwa. It can be roasted and eaten with coconut or palm kernel. It can also be prepared as a porridge which is what this page is about. 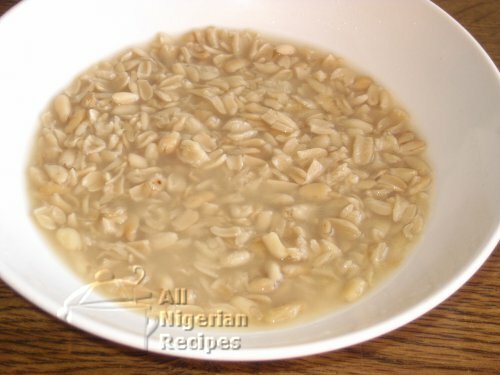 Freshly peeled ukwa or dried ukwa can be used for this recipe. You can use stock fish instead of dry fish or both. By fresh bitter leaves I mean bitter leaves that have NOT been washed and squeezed. Always add enough palm oil to make your Nigerian meals look appetizing. Edible potash acts as food tenderizer. Only a very small quantity should be used. If you are lucky to buy freshly dehusked ukwa seeds from the same tree, you will not need to use the food tenderiser. I do not know any alternative to edible potash. If using dry ukwa, soak it overnight in plenty of cold water. If using fresh ukwa, skip this step. The next day, soak, debone and wash the dry fish or stock fish and break into pieces. Wash the ukwa thoroughly in cold water. Stones and sand usually settle at the bottom so watch out for those. Rinse the bitter leaves and set aside. Put the thoroughly washed ukwa in a sizeable pot. I used a pressure pot in the video below because it cooks the ukwa much faster. Pour enough water to cover the ukwa. The level of water should be about 1 inch above the level of the ukwa. Add the edible potash. Add the dry fish or stock fish, cover the pot and cook till well done. The ukwa is done when the seeds melt when pressed. You may need to top up the water while cooking so watch it closely. If using a pressure pot, top ups will not be necessary. Add enough palm oil to the well done ukwa, add pepper, stock cubes and salt to taste. Stir. Cover and cook on medium heat till the palm oil changes colour from red to yellow. This should take about 5 minutes. Stir and add the bitter leaves. Cover and leave to simmer or till the leaves wilt but still green and the ukwa is ready to be served. If you have a pressure pot, ukwa is one of the Nigerian recipes that you should use it for because it cuts the cooking time by a lot. For pressure pots, follow the directions above up till Step 2. Then for step 3, add edible potash, dry fish or stock fish, pepper, salt to taste, stock cubes and palm oil. Cover, pressurize and cook for 30 minutes. I set the pressure on my pot to 1 and my cooker to heat 7 (my burner's heat settings range from 1-9). After 30 minutes with the above settings, the ukwa should be well done. Depressurize the pot under running water and add the bitter leaves. Cover and cook till the vegetables wilt but are still green. There is no need to pressurize the pot during this step. Note: Breadfruit Porridge gets thicker as it cools down so ensure you have enough porridge in the meal when done. Serve with chilled palm wine, palmy. Awww! Or any other chilled drink.